How much do you know about the Messaging feature on an Android smart phone? Not specialized in the mobile phone industry, I guess not many of you have good awareness of the exact functions of an Android phone. 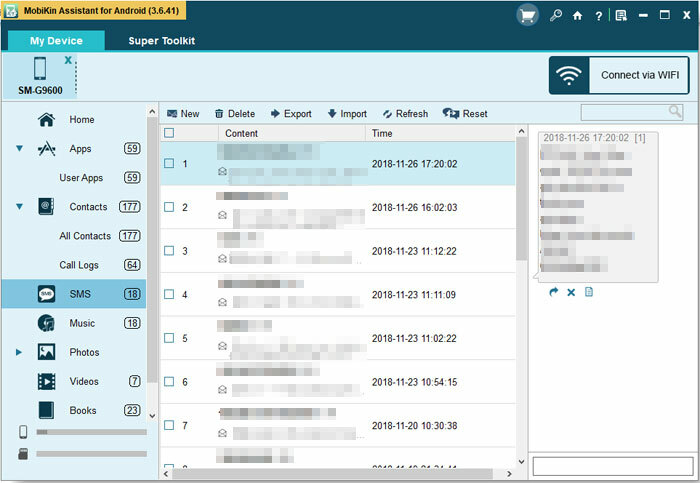 According to a professional report, SMS and MMS are available forms of messaging, including threaded text messaging and Android Cloud to Device Messaging (C2DM) and now enhanced version of C2DM. Android Google Cloud Messaging (GCM) is also a part of Android Push Messaging services. These stunning features affect people's communication activities on daily life. And once they switch a new Android phone, it's necessary to move some SMS messages from the old Android to the new Android phone if the text conversations are crucial. How to transfer SMS from Android to Android? That is the question you may come up with. 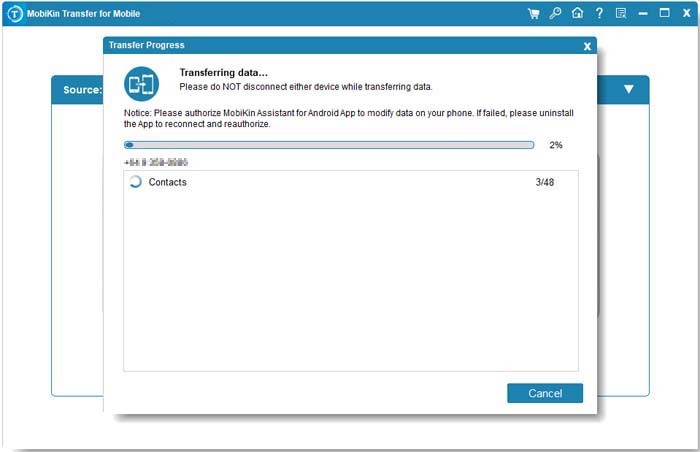 To solve the problem, you should let a professional phone transfer tool help you. The Mobile Phone Data Transfer is the quality one that we kindly recommend. Aside from Android OS, it is compatible with other operating systems including iOS, Symbian, BlackBerry and Windows Phone. As for the data, you can transfer SMS from Android to Android as well as more files such as contact, call logs, apps, videos, photos and music. 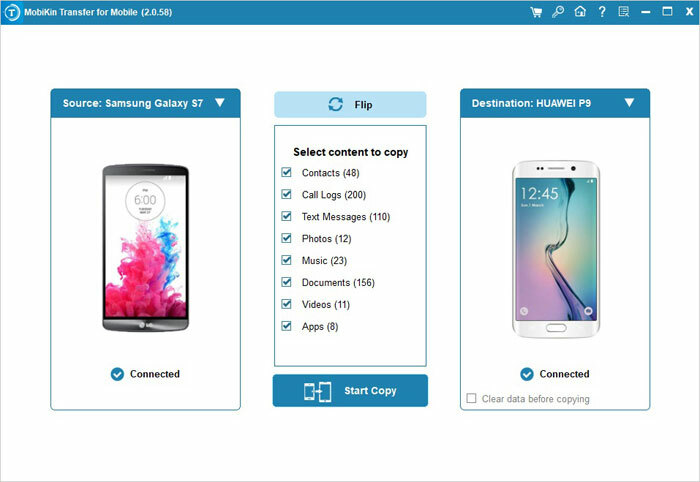 All in all, the phone transfer tool allows you to spend less time and be more efficient in synchronizing data between Android smart phones or other devices. After the installation of the Android phone transfer software, launch it on your computer and you'll see a window like this. Link your Android phones to the computer via USB cables. There are several modes shown on the main interface. But to transfer SMS from Android to Android, you need to select the "Phone to Phone Transfer" mode from them. The data can be transferred are displayed on the menu. Mark the "SMS" option and hit the "Start Copy" button. Then the program will start to transfer SMS from one Android phone to another. 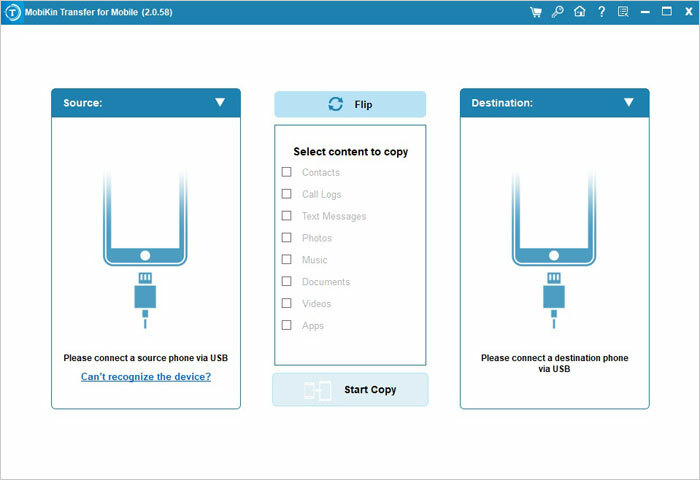 When this transmission part is done, you can copy other data like music, videos, photos, contacts, apps and call logs between Android devices similarly. Note: Click "Flip" to reverse the positions of the Android phones as the source and destination devices. See more: Get the Android SMS Recovery to recover deleted SMS from Android to computer or Mac. If you don't want to use the above method to reach the goal, or if you have installed a MobiKin Assistant for Android (Windows/Mac) on your PC or Mac computer, then we could like to strongly to recommend you move SMS between Android devices by using this all-round Android manager program. Below is the interface of the Android SMS manager, and you can directly use the "Export" function to backup your Android messages as .json format, and after that, link another phone to the computer, and use the "Import" button to load the exported .json file to the Android device as you like.